Does your legislative candidate value secular government? Arizona early voting ballots arrive in mailboxes across the state over the next few days. In-person voting is less than 4 weeks away, on November 8. Many of you have asked us if we know anything about your legislative candidate's stance on secular government. If your candidate is a returning lawmaker, you can find his or her "Secular Score" on our "Secular Scorecard" from 2015 and 2016. Read more about Does your legislative candidate value secular government? Americans United for the Separation of Church and State (AU) has filed a lawsuit against Heritage Academy, a charter school in the Phoenix area with campuses in Queen Creek, Laveen and Mesa. According to the suit, the lawsuit is a result of the school's "violation of the First Amendment by providing religious education to its students." The suit specifically names school founder and principal Earl Taylor Jr. Mr. Taylor is accused of teaching religious and religiously based principles in the mandatory American Government class, which he instructs. Read more or click here to see the original post written by the Public Religion Research Institute (PRRI) about their latest national survey that highlights an important and growing group: The religiously unaffiliated. This is why secular activism and political involvement is so important at all levels of government: local, state, and national. Today, Secular Coalition for Arizona sent a request to all candidates running for the State House and State Senate to complete our 2016 Candidate Questionnaire. We will post responses exactly as received on our website. Responses are requested by October 3, 2016. We will only accept submissions from official candidate email addresses as listed on the Arizona Secretary of State's website. Encourage your legislative candidates to submit their answers. Americans United for Separation of Church and State (AU) intends to file suit against an Arizona public charter school that has been providing religious instruction to students in a mandatory American Government course. The course material claims that "America and its Constitution were established by the hand of God," and that the U.S. will prosper only when its leaders obey and implement God's law as described in the Bible. Secular AZ holds that a government meeting is not an appropriate forum for prayer. While the right to public prayer at government meetings has been upheld in 2014 by the U.S. Supreme Court, this ruling specified that prayers and invocations offered should be inclusive of all religious and philosophical views represented by the population governed. The 2017 Legislative Wrap Up is here! 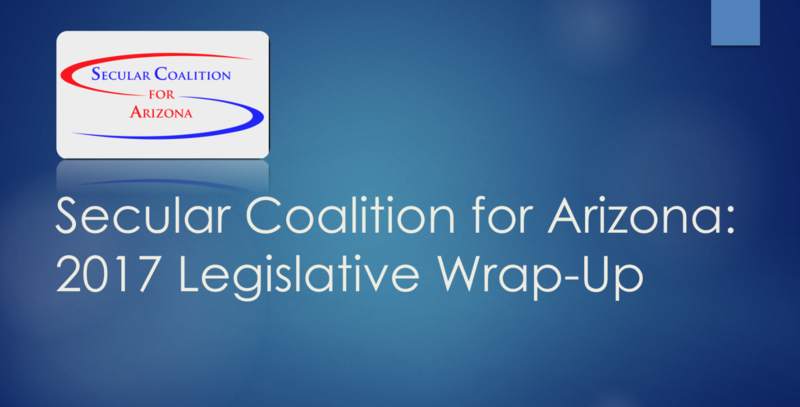 Read more about The 2017 Legislative Wrap Up is here! Secular AZ is celebrating the end of the 2nd session of the 52nd Regular Legislature with Happy Hour awards ceremonies in both Tempe and Tucson. We'll be raising funds to continue our important work, recognizing lawmakers who went above and beyond just voting to support secular public policy and celebrating our victories in fortifying the wall separating church and state. Read more about Sine Die Celebrations! “Director Jeffries has long been known for his ‘quirky’ style of leadership, which includes frequent mention of his religious views in DES all-employee meetings and on video presentations,” said Zenaido Quintana, chair of Secular Coalition for Arizona. “This latest all-employee email, which was sent to us by a DES employee disturbed by its contents, is particularly egregious and could have had him fired from many companies - organizations where policies are in place to prevent work email from being used to proselytize religion. Secular Coalition for Arizona was the only group speaking up in committee Wednesday against SB1474: human fetus; embryo; prohibited actions; a bill motivated by the now-discredited infamous "Planned Parenthood" videos released last summer. Our take: Government policy on the use of fetal tissue should be based on scientific and medical research.